Heavens to Mergatroyd: The question must still be asked: Why does anyone take Sam Harris seriously? The question must still be asked: Why does anyone take Sam Harris seriously? Sam Harris, like Steven Pinker is a New Atheist with a hoard of worshipful fan-boys. I am on the record disliking Harris since 2009. 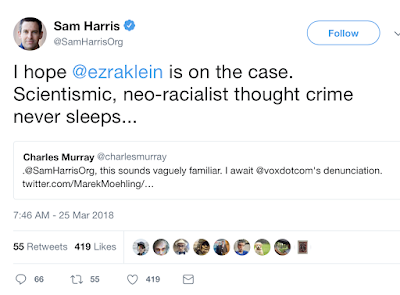 Including writing blog posts entitled Why Sam Harris is a second-rate thinker, at best and Sam Harris throws a hissyfit and Sam Harris is still a xenophobic bigot. 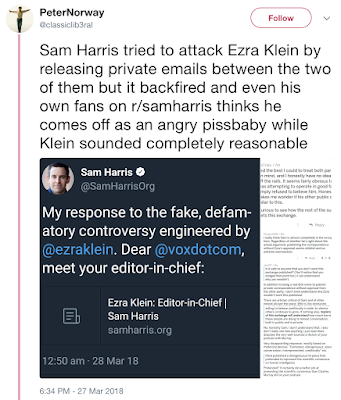 I've also referenced this article Why does anyone take Sam Harris seriously? many times. But I've mostly ignored him in my evo-psycho bros series since he's been less obviously hereditarian than people like Pinker and Jerry Coyne. Well he's fixed that. 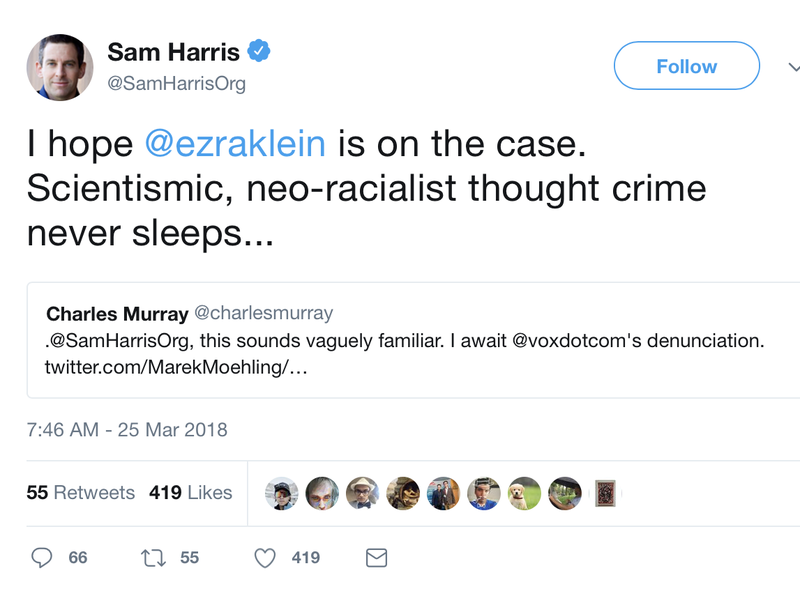 Recently Harris was sympathizing with Charles Murray, the heir to the racism-infused science of the Pioneer Fund, and got into a debate with journalist Ezra Klein. Then more recently Harris, like Pinker and Razib Khan seem to be under the impression that the recent NYTimes op-ed by David Reich supports hereditarian views when it doesn't. 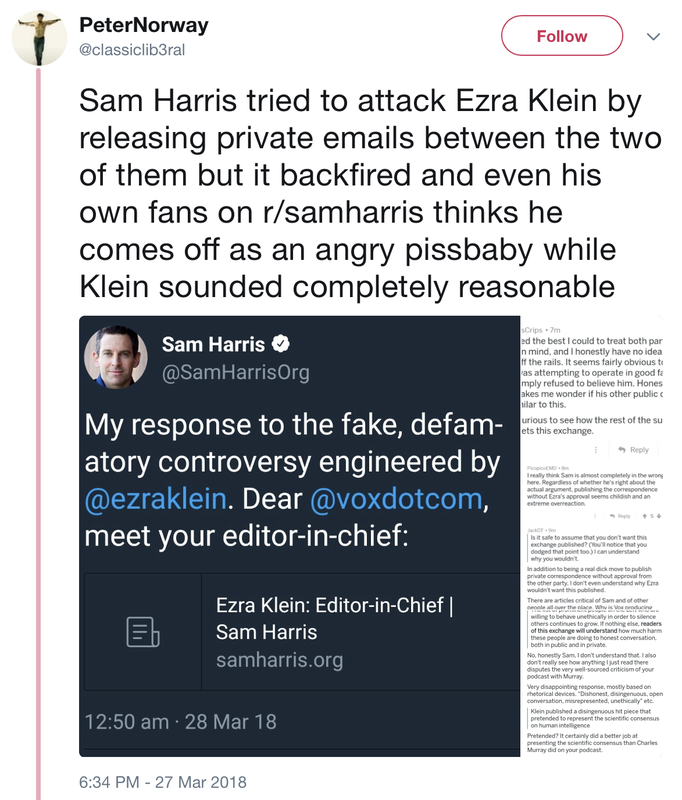 Harris called out Ezra Klein on Twitter about the article. Big mistake. Klein published this excellent piece Sam Harris, Charles Murray, and the allure of race science which caused Harris to have a meltdown.